Diese Presse und Medien-Information wird zur Verfügung gestellt in englischer und in deutscher Sprache. 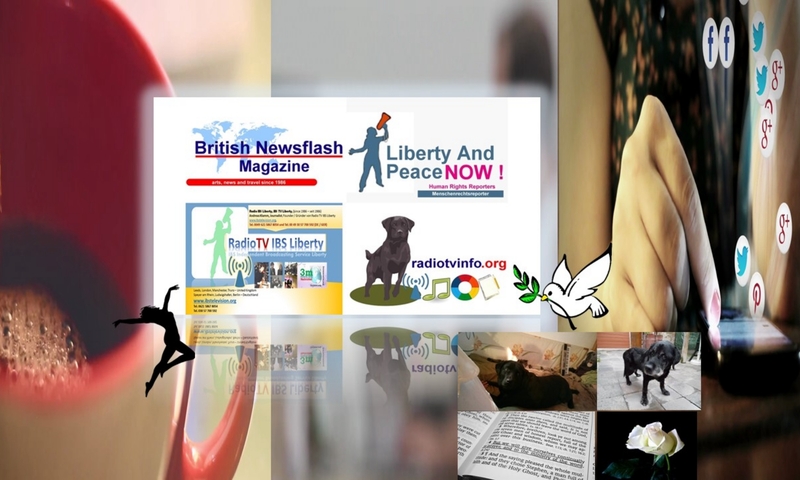 This PRESS AND MEDIA NEWS RELEASE is provided in the English And German language. Analakininina (Madagascar) / Konstanz / Berlin / Neuhofen / Frankenthal / Schifferstadt (Germany). 1. Februar 2013. Dear Members Of The Press ! 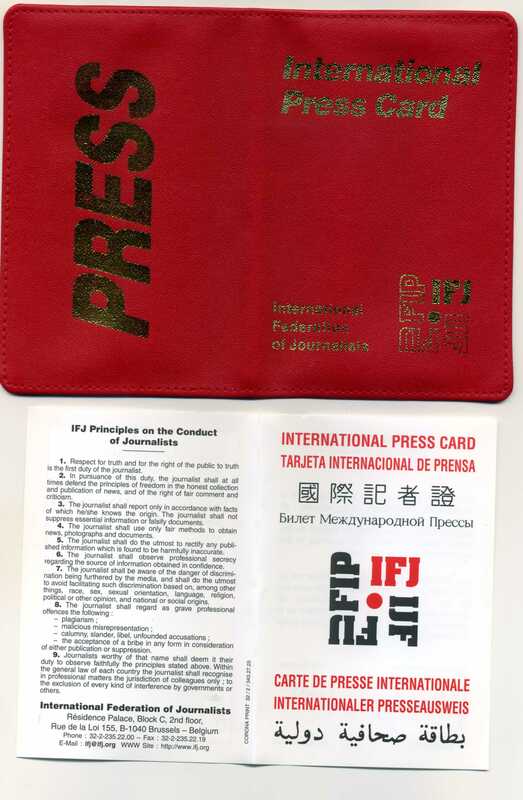 Dear Colleagues of International Press, Media ! Dear Sir ! Dear Madam ! 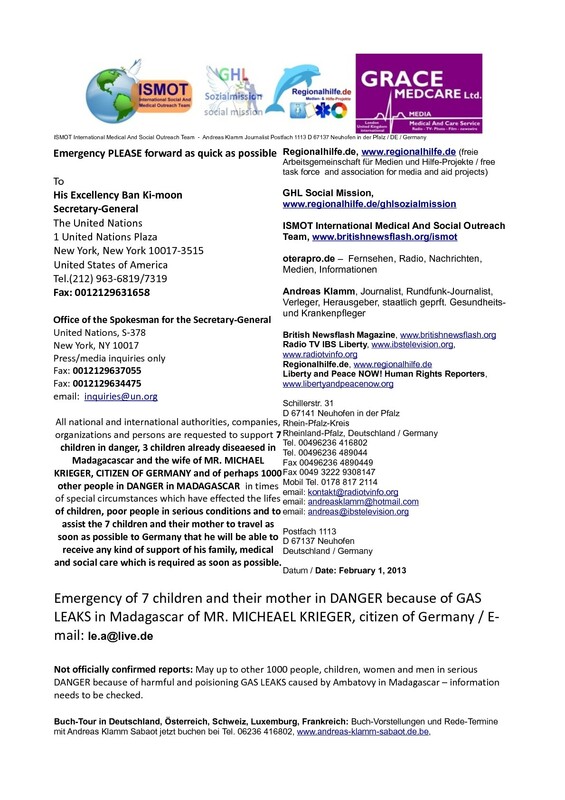 According to the reports of MR MICHAEL KRIEGER, a citizen of Germany and father of 18 children his 7 children and his wife Lydia KRIEGER are in DANGER BECAUSE OF POISIONING AND HARMFUL GAS LEAKS CAUSED BY AMBATOVY in Madagascar. According to the eye witness report of MR MICHAEL KRIEGER up to 1000 other people in Madagascar could be in serious DANGER. 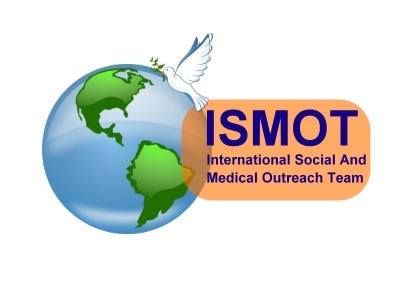 ISMOT International Social And Medcial Outreach Team, http://ismotnetwork.wordpress.com which I have founded because of the EMERGENCY of a pregnant woman Mrs. Natalie F., Berlin, German cituen and her two daughters, little children which have been in DANGER in 2008 in NASSAU in Bahamas does not receive any kind of donations. We do not have even a bank account and we do not have all the rescue workers, which will be NEEDED in Madagascar to rescue 7 children and their mother in DANGER and perhaps up to other 1000 people which could be in DANGER because of poisioning and harmful GAS LEAKS caused by Ambatovy in Madagascar / Africa. Therefore after a lot of PRAYER and CALLING and requesting help, resuce and support from the ALLMIGHTY AND HOLY GOD, we have send now also after asking Police and about 80 aid and relief organizations for urgent help, a REQUEST to the U.N. General Secreatary, HIS EXCELLENCY MR. BAN Ki-MOON, to rescue and to save the lifes of 7 children, their mother and may even 1000 more people and for an international and indenpendent investigation about these incidents in Madagascar. More information you will find on http://madagascarfamilycare.wordpress.com . 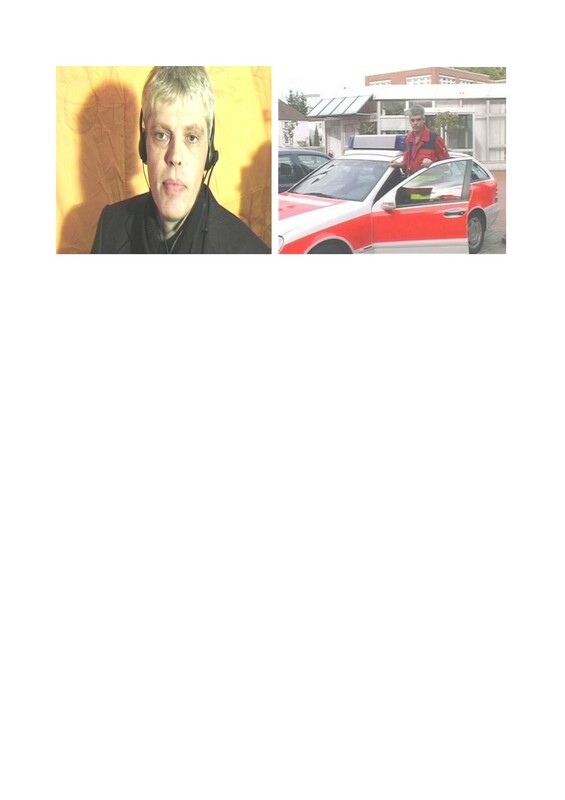 The eye witness Mr. Michael Krieger could be availalbe for interview upon request. 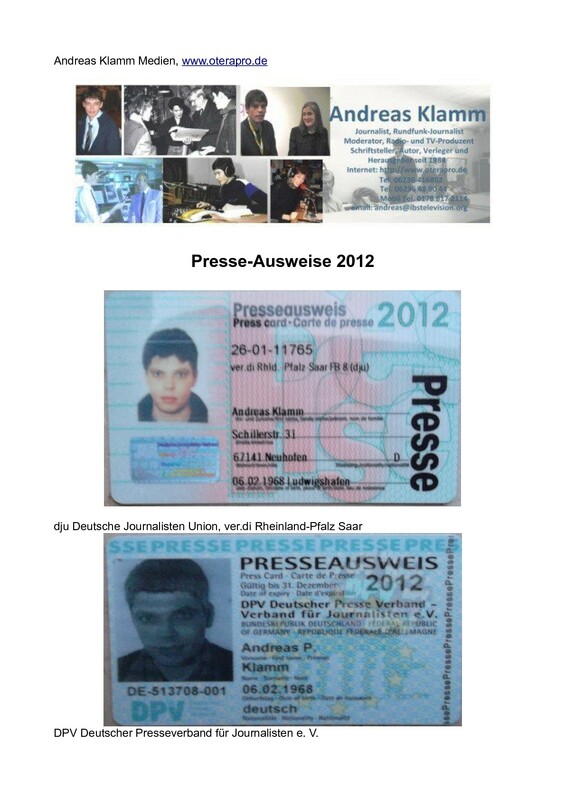 Sehr geehrte Mitglieder der Presse ! 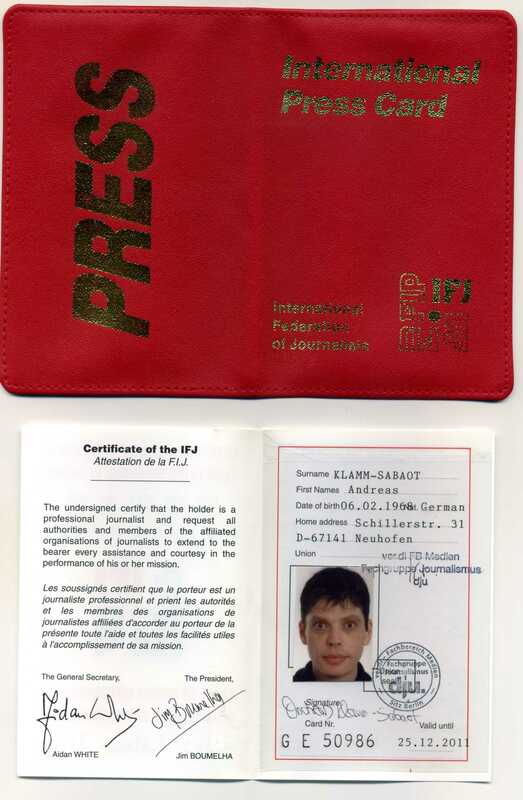 Sehr geehrte Kollegen und Kolleginnen der Internationalen Presse und Medien ! Auf der Grundlage von Informationen und Berichten, des Herrn MICHAEL KRIEGER, ein deutscher Staatsbürger und Vater von 18 Kindern, befinden sich 7 seiner Kinder und seine Frau Lydia KRIEGER in GEFAHR aufgrund hochgiftiger und verletzender GAS-AUSTRITTE verursacht vom Ambatovy Konzern in MADAGASCAR. Auf der Grundlage der Augen-Zeugen-Berichte des Herrn Michael Krieger sind möglicherweise weitere 1000 Menschen in der Gefahren-Zone in Madagascar in GEFAHR. 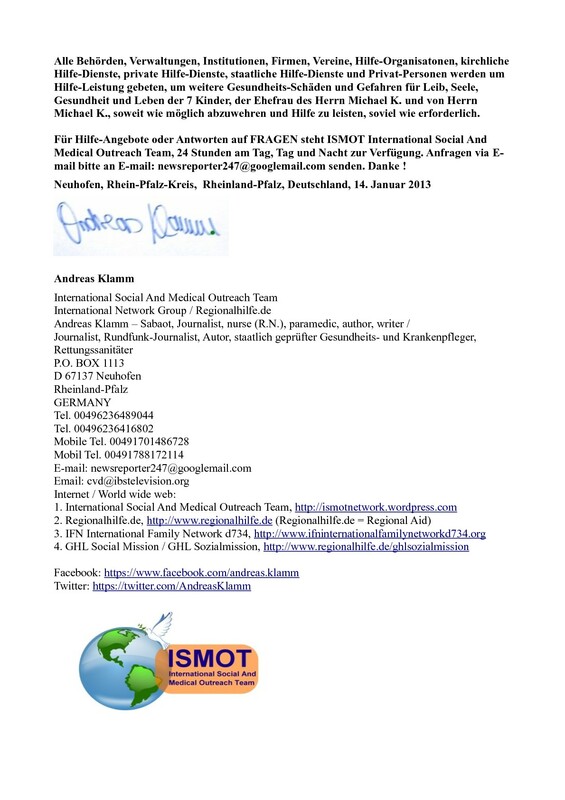 ISMOT International Social And Medical Outreacht Team, http://ismotnetwork.wordpress.com , eine freie Arbeitsgemeinschaft für Medien- und Hilfe-Projekte, die ich aufgrund eines schweren NOTFALLS einer damals hochschwangeren Mutter, Frau Natalie F. aus Berlin und ihrer zwei kleinen Töchter (damals war das zweite Klein-Kind und Mädchen noch nicht geboren) in Nassau, Bahamas in zum Teil tödlicher GEFAHR gegründet habe, erhält in der Regel keine Spenden. ISMOT International Social And Medcial Outreach Team hat noch nicht einmal ein einziges Bank-Konto und wir haben nicht die Vielzahl der RETTUNGSKRÄFTE, die jetzt möglicherweise benötigt werden um 7 Kinder, deren Mutter und 1000 weitere Menschen aus einer gefährlichen GEFAHREN-ZONE zu retten. Aus diesem Grund wurde die Hilfe von GOTT DEM HERRN an erster Stelle erbeten und angefordert. 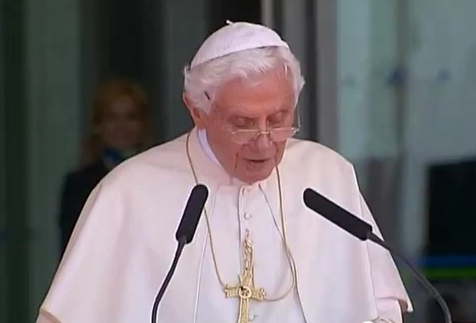 Zudem wurde die Deutsche Botschaft, das Auswärtige, Amt, Polizei in Schifferstadt in der Pfalz, Polizei in Konstanz, Mitglieder des Deutschen Bundestags, Bundespräsident Dr. h. c. Joachim Gauchk, Papst Benedikt XVI., (Vatikan-Staat, Rom), Präses Nikolaus Schneider von der Evangelischen Kirche in Deutschland (EKD), Staatsanwaltschaft in Frankenthal, der Ministerpräsident von Baden-Württemberg Windfried Kretschmann, der Innenminister von Baden-Württemberg, Herr Reinhold Gall und weitere Behörden, Organisationen, Hilfe-Organisationen und Vereine informiert. Da die 7 Kindern und ihre Mutter immerhin bereits seit 7. Oktober 2012, dem TAG der Antragstellung auf Konsular-Hilfe nach Paragraph 5 des Konsular-Hilfe-Gesetzes, nunmehr seit fast fünf Monaten auf eine Rettung und Hilfeleistung warten und diese Hilfeleistung immer noch nicht erfolgt ist, wurde jetzt mittels Schreiben, gesendet, via FAX, der U.N. General-Sekretär der Vereinten Nationen, Seine Excellenz Ban Ki-Moon und die Gemeinschaft der Vereinten Nationen DRINGEND um RETTUNG und Hilfeleistung gebeten von 7 Kindern und deren Mutter Lydia KRIEGER, die dringend zwecks Hilfe und medizinischer Versorgung zu ihrem Vater nach Deutschland nach Konstanz reisen wollen und zum Zwecke der Hilfeleistung für möglicherweise weitere 1000 Menschen und eine bislang nicht näher bekannte Anzahl von Tieren, die sich in der GEFAHREN-ZONE in MADAGASCAR nach Berichten des Augen-Zeugen, Herrn Michael KRIEGER, befinden. Für die Beantwortung von FRAGEN stehe ich Ihnen TAG und NACHT zur Verfügung, via Mobil Tel. 00491701486728 oder Mobil-Tel. 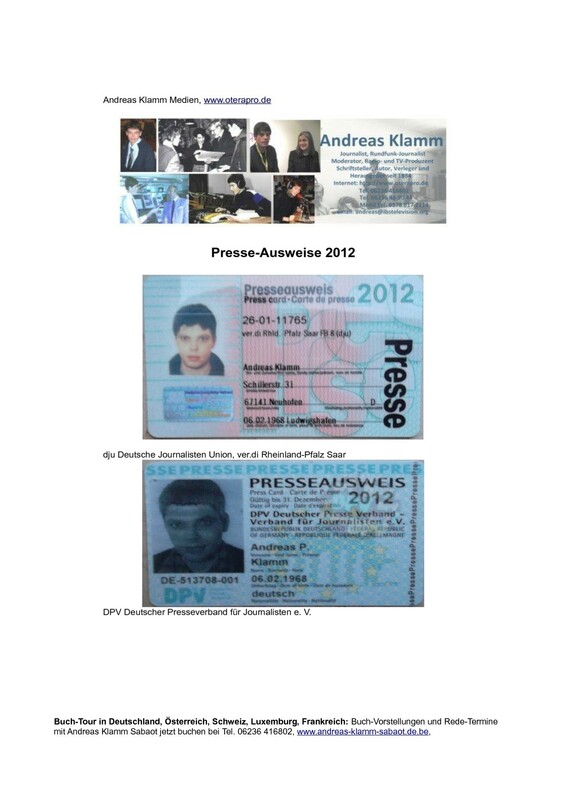 00491788172114, via E-mail: newsreporter247@googlemail.com oder E-mail: andreasklamm@hotmail.com . 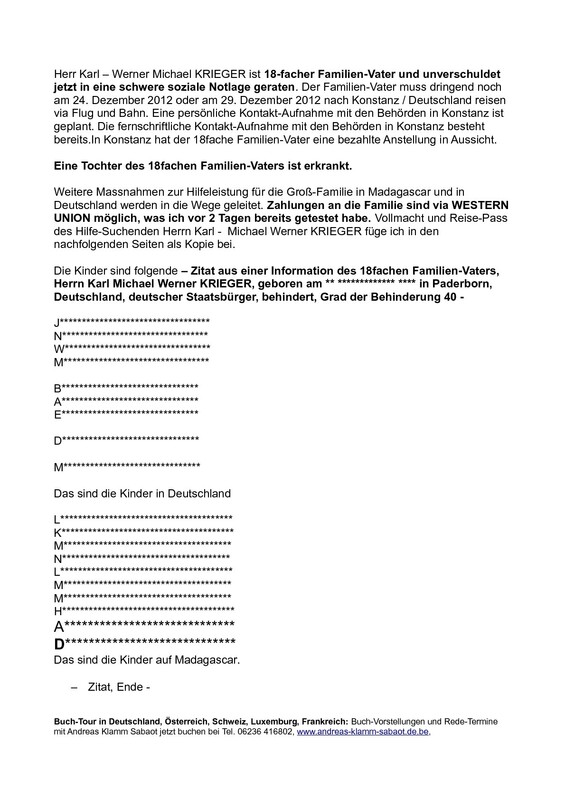 Weitere Infomationen finden Sie auch bei http://madagascarfamilycare.wordpress.com . Der Augen-Zeuge Herr Michael Krieger ist möglicherweise auch für Interviews für Radio, Fernsehen, Medien zu erreichen. 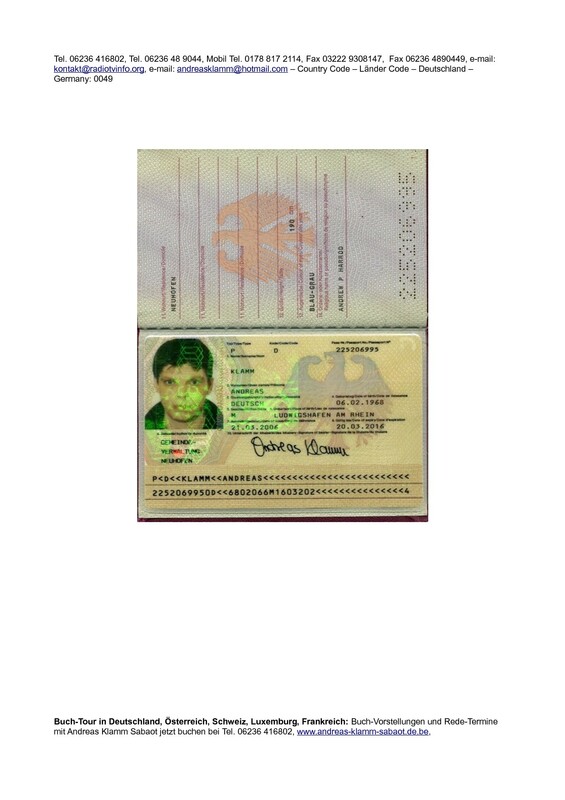 All national and international authorities, companies, organizations and persons are requested to support 7 children in danger, 3 children already diseaesed in Madagacascar and the wife of MR. MICHAEL KRIEGER, CITIZEN OF GERMANY and of perhaps 1000 other people in DANGER in MADAGASCAR in times of special circumstances which have effected the lifes of children, poor people in serious conditions and to assist the 7 children and their mother to travel as soon as possible to Germany that he will be able to receive any kind of support of his family, medical and social care which is required as soon as possible. 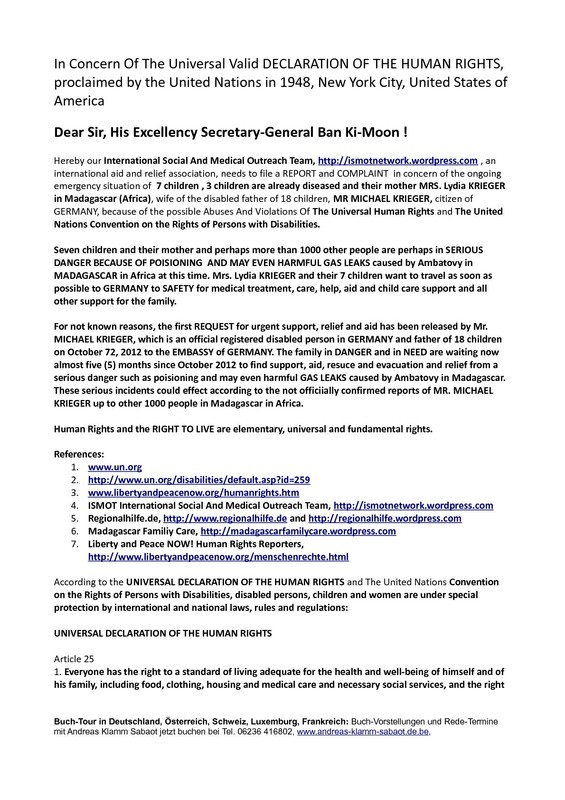 Dear Sir, His Excellency Secretary-General Ban Ki-Moon ! Hereby our International Social And Medical Outreach Team, http://ismotnetwork.wordpress.com , an international aid and relief association, needs to file a REPORT and COMPLAINT in concern of the ongoing emergency situation of 7 children , 3 children are already diseased and their mother MRS. Lydia KRIEGER in Madagascar (Africa), wife of the disabled father of 18 children, MR MICHAEL KRIEGER, citizen of GERMANY, because of the possible Abuses And Violations Of The Universal Human Rights and The United Nations Convention on the Rights of Persons with Disabilities. Seven children and their mother and perhaps more than 1000 other people are perhaps in SERIOUS DANGER BECAUSE OF POISIONING AND MAY EVEN HARMFUL GAS LEAKS caused by Ambatovy in MADAGASCAR in Africa at this time. 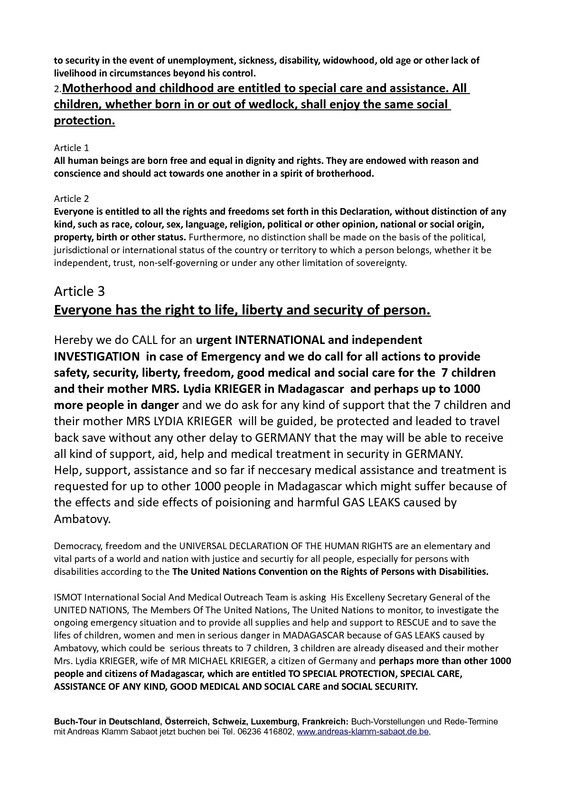 Mrs. Lydia KRIEGER and their 7 children want to travel as soon as possible to GERMANY to SAFETY for medical treatment, care, help, aid and child care support and all other support for the family. 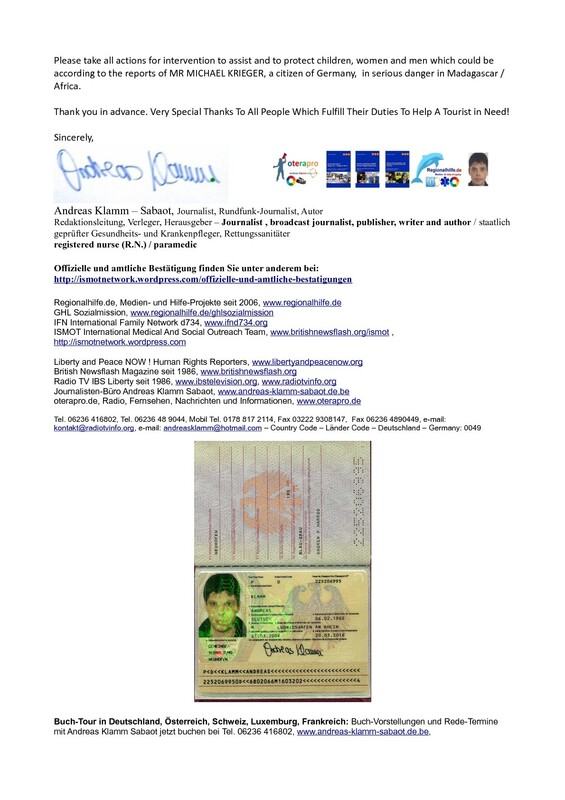 For not known reasons, the first REQUEST for urgent support, relief and aid has been released by Mr. MICHAEL KRIEGER, which is an official registered disabled person in GERMANY and father of 18 children on October 72, 2012 to the EMBASSY of GERMANY. The family in DANGER and in NEED are waiting now almost five (5) months since October 2012 to find support, aid, resuce and evacuation and relief from a serious danger such as poisioning and may even harmful GAS LEAKS caused by Ambatovy in Madagascar. These serious incidents could effect according to the not officiially confirmed reports of MR. MICHAEL KRIEGER up to other 1000 people in Madagascar in Africa. Human Rights and the RIGHT TO LIVE are elementary, universal and fundamental rights. Hereby we do CALL for an urgent INTERNATIONAL and independent INVESTIGATION in case of Emergency and we do call for all actions to provide safety, security, liberty, freedom, good medical and social care for the 7 children and their mother MRS. Lydia KRIEGER in Madagascar and perhaps up to 1000 more people in danger and we do ask for any kind of support that the 7 children and their mother MRS LYDIA KRIEGER will be guided, be protected and leaded to travel back save without any other delay to GERMANY that the may will be able to receive all kind of support, aid, help and medical treatment in security in GERMANY. Help, support, assistance and so far if neccesary medical assistance and treatment is requested for up to other 1000 people in Madagascar which might suffer because of the effects and side effects of poisioning and harmful GAS LEAKS caused by Ambatovy. Democracy, freedom and the UNIVERSAL DECLARATION OF THE HUMAN RIGHTS are an elementary and vital parts of a world and nation with justice and securtiy for all people, especially for persons with disabilities according to the The United Nations Convention on the Rights of Persons with Disabilities. ISMOT International Social And Medical Outreach Team is asking His Excelleny Secretary General of the UNITED NATIONS, The Members Of The United Nations, The United Nations to monitor, to investigate the ongoing emergency situation and to provide all supplies and help and support to RESCUE and to save the lifes of children, women and men in serious danger in MADAGASCAR because of GAS LEAKS caused by Ambatovy, which could be serious threats to 7 children, 3 children are already diseased and their mother Mrs. Lydia KRIEGER, wife of MR MICHAEL KRIEGER, a citizen of Germany and perhaps more than other 1000 people and citizens of Madagascar, which are entitled TO SPECIAL PROTECTION, SPECIAL CARE, ASSISTANCE OF ANY KIND, GOOD MEDICAL AND SOCIAL CARE and SOCIAL SECURITY. Please take all actions for intervention to assist and to protect children, women and men which could be according to the reports of MR MICHAEL KRIEGER, a citizen of Germany, in serious danger in Madagascar / Africa. Thank you in advance. Very Special Thanks To All People Which Fulfill Their Duties To Help A Tourist in Need! 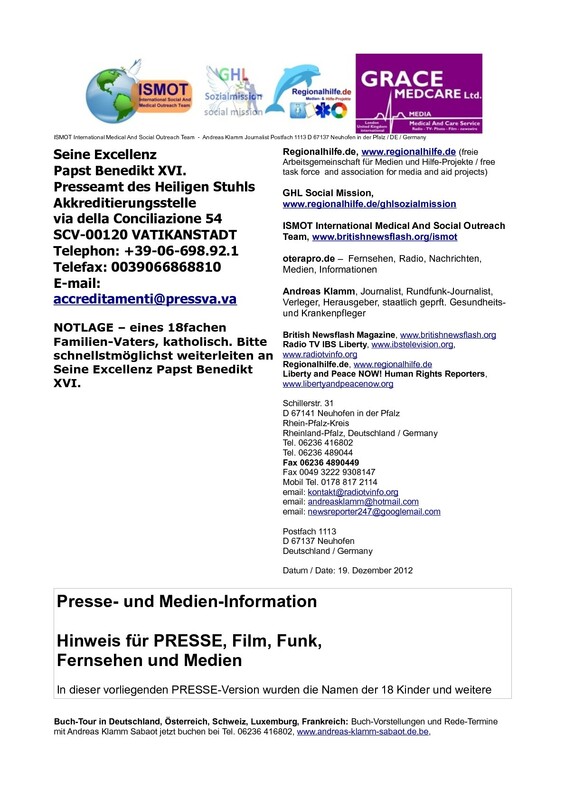 Familie in Notlage: Wird Papst Benedikt XVI. eine Ehren-Partenschaft übernehmen ? Mehrfacher Familien-Vater in Not sucht dringend Rechtsanwalt in Deutschland und edle Lebensretter Sieben Kinder in Madagascar in Gefahr, zwei Kinder einer Großfamilie bereits erkrankt – Familienvater fleht um Hilfe für Reise nach Konstanz und sucht Rechtsanwalt Von Andreas Klamm, Journalist Berlin. 7. Januar 2013. Michael K. (59) aus Paderborn ist ein insgesamt 18facher Familien-Vater, der vor rund 20 Jahren Deutschland verlassen hat. Bis vor wenigen Monaten ging es dem Familien-Vater mit seinen sieben Kindern in Madagascar und seiner Ehefrau unter bescheidenen Verhältnissen einigermassen gut. Doch jetzt setzt ein sehr großer Chemie-Konzern einmal in der Woche hochgiftige Ammoniak-Gase im Zusammenhang von Nickel-Auswaschsungen frei. In der Folge der hochgiftigen Ammoniak-Gas-Belastungen sind der mehrfache Familien-Vater mit umstritteem Ruf, sieben minderjährige Kinder und seine Ehefrau iunverschuldet n schwerste Not geraten. Die Familie ist nicht für die Handlungsweisen eines großen Chemie-Konzernes in Madagascar verantworltich. Anfang Dezember 2012 hat der Familienvater mit sieben Kindern und Ehefrau in Not die Deutsche Botschaft in Madagascar und das Auswärtige Amt dringend um Hilfe gebeten, da zwei Kinder der sieben Kinder bereits erkrankt sind. Michael K. Sucht verzweifelt um Hilfe. 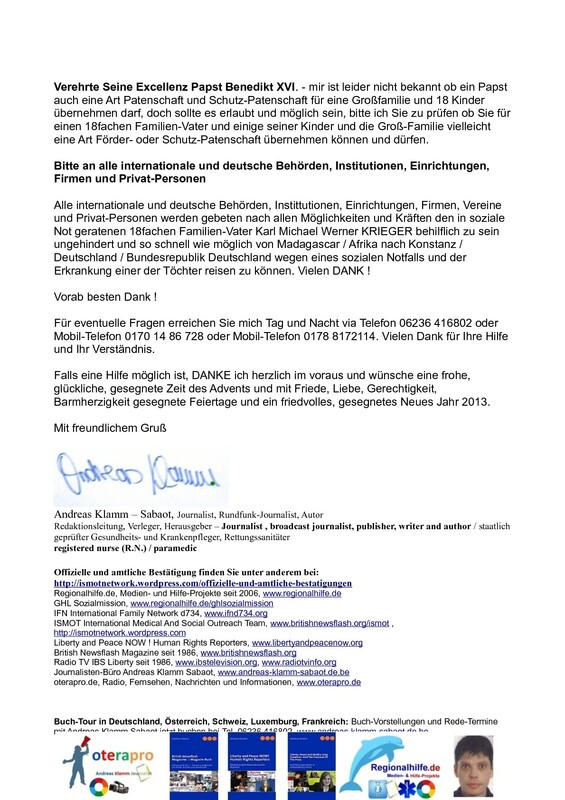 Man mache ihm sehr schwere, ungeheuerliche Vorwürfe und der Herz-kranke Mann (ärztliches Attest) liegt der Redaktiion von Regionalhilfe.de / ISMOT Internatonal Social And Medical Outreach Team vor, sucht verzweifelt nach einem Rechtsanwalt für Strafrecht, Verwaltungsrecht und Sozialrecht. Die Mitarbeiter der Deutschen Botschaft und des Auswärtigen Amtes in Berlin prüfen nun immerhin schon seit knapp fünf Wochen in Berlin und in Madagascar wie einer unverschuldet in Not geratenen Familie unbürokratisch, angemessen schnell und menschlich geholfen werden kann, um die Familie mit sieben minderjährigen Kindern sicher aus der Gefahrenzone in Madagascar zu bringen und eine sichere Reise nach Deutschland nach Konstanz zu ermöglichen. Bei der Stadt Konstanz bein den Meldebehörden, Einwohnermeldeamt, beim Oberbürgermeister und bei der Polizei wurde ein Eil-Gnadenantrag zur Anmeldung des künftigen ersten Wohnsitzes bereits am 23. 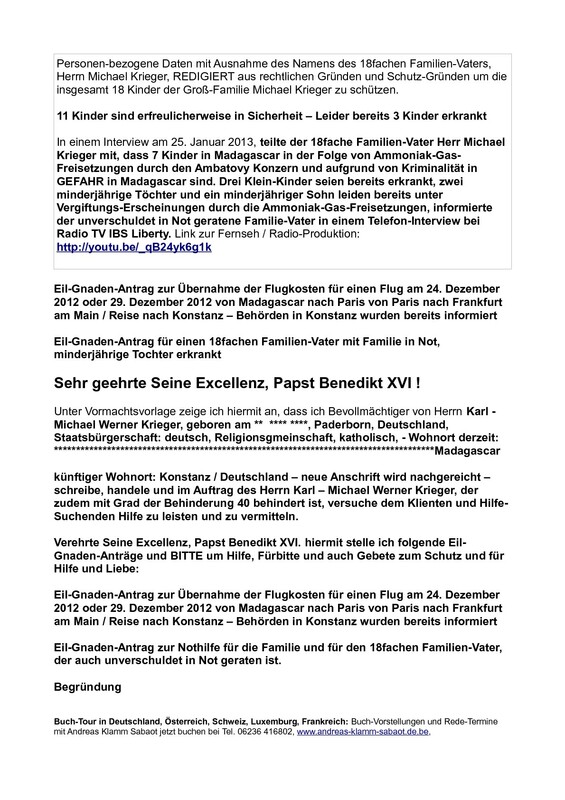 Dezember 2012 im Auftrag des mehrfachen in Not geratenen Familienvaters mnittels Fax-Schreiben beantragt und gesendet. Der Familienvater der Großfamilie scheiterte mit einem Unternehmen vor einigen Jahren im Osten von Deutschland. Durch das Scheitern des Unternehmens ist ein Verlust von mehreren Millionen entstanden. Die Lebenshaltungskosten in Madagascar seien zwar günstiger, doch gäbe es im drittärmsten Land der Welt kein soziales Sicherungs-System wie in Deutschland, informiert der Familienvater mit sieben Kinder in schwerster Not. Michael K. Ist deutscher Staatsbürger und seine sieben Kinder haben damit einen begründeten Rechtsanspruch auf die deutsche Staatsbürgerschaft. Diese Information bestätigte heute Vormittag in einer telefonischen Anfrage auch ein Mitarbeiter des Bundesverwaltungsamtes in Berlin. Das Auswärtige Amt in Berlin prüft weiter, teile eine Mitarbeiterin des Auswärtigen Amtes in einem E-mail-Schreiben mit. Doch die Zeit für die Rettungsmassnahmen für eine Familie mit sieben Kindern in Not durchzuführen wird knapp: Zwei Kinder der sieben minderjährigen Kinder sind bereits erkrankt. Eine dringende Reise des Familien-Vaterrs nach Konstanz in Deutschland ist wichtig, damit der Mann persönlich bei der Stadtverwaltung und beim dem für ihn zuständigen Jobcenter vorsprechen kann. Die gute Nachricht, so schreibt der Vater der sieben Kinder, sei, dass er einen Arbeitsplatz mit Bezahlung in Konstanz in Aussicht habe. Vielleicht könnte es ihm dann gelingen zumindest für den Unterhalt eines Teils seiner insgesamt 18 Kinder aufzukommen oder zumindest doch seine sieben Kinder zu versorgen, die derzeit noch in Madagascar in schwerer Notlage sind. Der insgesamt 18fache Familien-Vater hat kaum noch eine ruhige Minute: „Ich habe Angst, dass meinen sieben Kindern etwas zustösst, ein Teil meiner Familie die Notlage nicht überlebt.“, schreibt er verzweifelt in seinen E-mails in denen er seit fünf Wochen um Hilfe nahezu auf Knien fleht und bittet. Polizei, Staatsanwaltschaft, Deutsche Botschaft, Auswätiges Amt und zahlreiche weitere Hilfe-Einrichtungen wurden bereits in Kenntnis gesetzt Am 7. Dezember 2012 erreichte ein verzweifelter Hilfe-Ruf des Familien-Vaters in Not die Redaktion von Regionalhilfe.de, (http://www.regionalhilfe.de) . Seither versuchen wir Hilfe zu leisten. Aufgrund des schwerwiegenden Notfalls einer gesamten Familie, behindertem Ehemann und mehrfachem Familien-Vater, sieben Kinder in schwerer Notlage und der Ehefrau in Gefahr und in Not, wurde nach einer weiteren Notruf SMS, unverzüglich und sofort die Polizei, Staatsanwaltschaft, berits zuvor die Deutsche Botschaft in Madagascar, das Auswärtige Amt in Berlin und einige weitere Hilfe-Einrichtungen über die bestehende schwere Notlage einer ganzen Familie in Gefahr durch Ammoniak Gas-Freisetzungen und finanzieller Mittellosigkeit informiert. Zur Zeit prüfen die Behörden seit knapp fünf Wochen, obgleich eine Prüfung sicher auch in Konstanz in Deutschland ohne weitere Gefahren für die Groß-Familie in Not möglich wäre. Der Familien-Vater erklärte, dass er mit den deutschen Behörden zusammenarbeiten wolle, um seine sieben Kinder, seine Ehefrau und sich selbst aus der Gefahrenzone in Madagascar nach Konstanz in Deutschland reisen zu lassen. Dringend Rechtsanwalt gesucht Obgleich zunächst auf der Grundlage der Allgemeinen Erklärung der Menschenrechte die sogenannte Unschulds-Vermutung gilt, sucht der mehrfache Familien-Vater dringend und sofort einen Rechtsanwalt für Strafrecht, Verwaltungsrecht und Sozialrecht, der auch bei finanzieller Mittllosigkeit der Familie der Familie in Not helfen kann. Dringend Helfer und edle Spender als Lebensrtter gesucht Der Familienvater sucht zur Finanzierung edle Spender, die dem Mann, vielmehr seiner Ehefrau via WESTERN UNION bereit sind, die Flug- und Reise-Kosten in Höhe von geschätzt cirka 700,– Euro zu spenden. 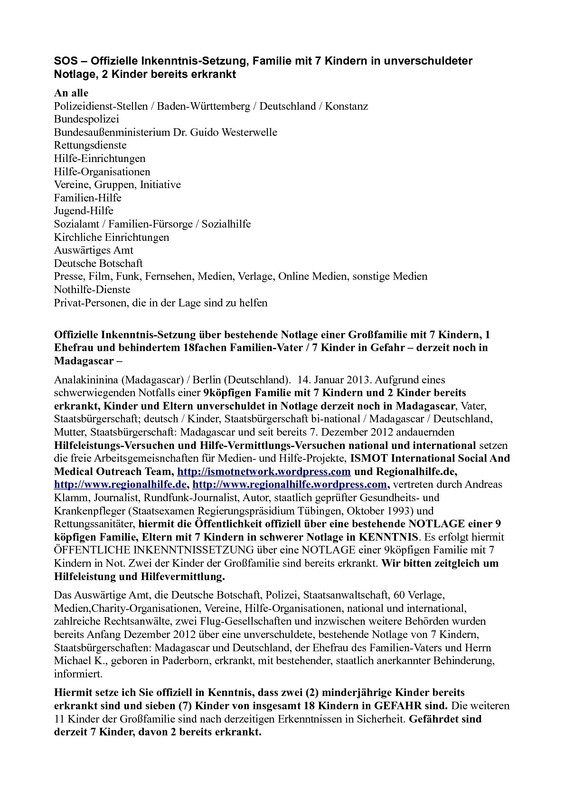 Wer helfen will oder kann, wird gebeten, Tag und Nacht mit der Redaktion von Regionalhilfe.de via email: newsreporter247@googlemail.com oder email: andreasklamm@hotmail.com Kontakt aufzunehmen. Die Daten zur Hilfe-Leistungen werden via E-mail gesendet. Telefonische Anfragen sind wegen der schwere der Notlage rund um die Uhr 24 Stunden möglich bei Mobil Tel. 01701486728, Mobil Tel. 01788172114 ode Telefon 06236416802, Tel. 06236489044, Fax 06236 4890449 – rund um die Uhr, Tag und Nacht, 24 Stunden am Tag. Weitere und ausführliche Informationen zu Regionalhilfe.de finden Sie unter anderem bei www.regionalhilfe.de und Informationen zu ISMOT Internatonal Social And Medical Outreach Team finden Sie bei http://ismotnetwork.wordpress.com . Bleibt zu hoffen, dass den sieben Kindern, zwei Kinder sind bereits erkrankt, kein weiterer ernstllicher Gesundheits-Schaden entsteht. Bei der Stadt Konstanz wurde bereits gebeten sofort die Familie-Hilfe zu verständigen, damit der Großfamilie professionell möglichst bald in Konstanz in Deutschland geholfen werden kann. Vermutlich wird es eine Herausforderung sein für eine Großfamilie mit sieben Kinder auch eine geeignete Sozial-Wohnung zu finden. Hinweise können unsere Leser und Leserinnen jederzeit gerne auch via email an unsere Redaktion senden. Vielleicht gelingt es vielen Menschen in Deutschland gemeinsam eine Großfamilie in schwerer Notlage mit gemeinsamen verantwortlichen Handeln aus tiefster Not und Verzweifelung zu befreien.